Conservation doesn't have to mean sacrifice. The Alteo 2.0 gpm showerhead utilizes Katalyst air induction technology to deliver an invigorating spray experience while saving up to 20% water consumption. Katalyst air-induction technology maximizes the air/water mix for a powerful, even flow. Optimized sprayface with 48 nozzles delivers a more focused coverage of large water droplets. Minimizes wasteful overspray and increases cleaning and hair-rinsing performance. MasterClean sprayface with translucent nozzles is easy to clean. With this top-notch showerhead from Delta, you can expect an amazing head-to-toe clean every time. Its 2-in-1 design really improves your shower time, making sure you don't miss any spots. 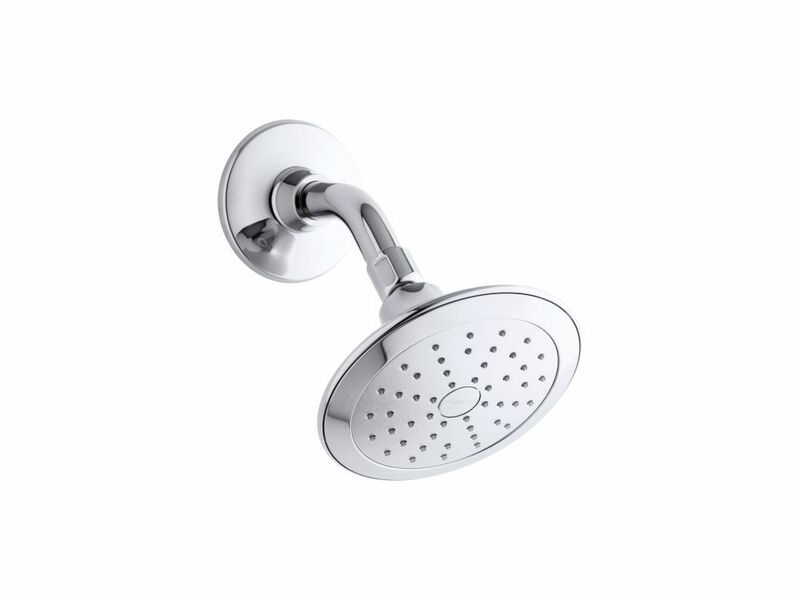 Turn your bathroom into a spa with this 2.25-inch D, 4.5-inch H, and 4-inch W showerhead, perfect for smaller spaces. Enjoy a shower that simulates the soaking deluge of a warm summer downpour. This traditional-style rainhead features innovative Katalyst air-induction technology, which efficiently mixes air and water to produce large water droplets and deliver a powerful, thoroughly drenching overhead shower experience. Its clean good looks and durable finish coordinate with many other KOHLER faucets and accessories. Take the guesswork out of designing a custom shower with this Forte Essentials performance showering package. Designed to upgrade your master or secondary bath, the package includes a multifunction showerhead and handshower, showerarm with diverter, slidebar kit, and Forte valve trim featuring a lever handle. Pair the trim with a Rite-Temp(R) pressure-balancing valve, which maintains your desired water temperature during pressure fluctuations. HydroRail-R allows you to easily upgrade a standard shower to a spa-like showering experience with luxurious overhead rain and handshower functionality. It's designed to accommodate a wide array of bath/shower configurations without altering in-wall plumbing, making it suitable for both remodels and new construction. This bath/shower column converts your single-outlet showerhead into a two-outlet custom showering experience, and has a slidebar bracket for easy height and angle adjustments to your handshower. For smooth toggling between handshower and rainhead functions, this column features a diverter conveniently located at the base. Alteo 1-Spray 5.6875 inch Rainhead Showerhead In Polished Chrome Conservation doesn't have to mean sacrifice. The Alteo 2.0 gpm showerhead utilizes Katalyst air induction technology to deliver an invigorating spray experience while saving up to 20% water consumption. Alteo 1-Spray 5.6875 inch Rainhead Showerhead In Polished Chrome is rated 4.0 out of 5 by 2. Rated 5 out of 5 by David from I had an excellent experience with the purchase. It was... I had an excellent experience with the purchase. It was easy to order on line. The package came a day earlier than expected and it was well packaged so there was no possibility of damage. Rated 3 out of 5 by Cheryl from When I received it I was amazed that it is... When I received it I was amazed that it is not made of medal. I thought it would have been.